Fig. 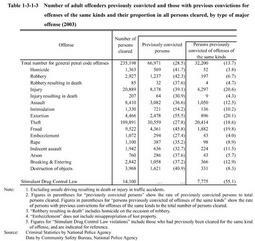 1-3-1-1 shows the number of adult and juvenile repeat offenders(people who have previously been cleared for committing an offense;hereinafter the same in this chapter)cleared for non-traffic penal code offenses(excluding unsafe driving resulting in death or injury in traffic accidents;hereinafter same in this chapter except for Table 1-3-1-4 )and their proportion to all persons cleared,over the last10years. In 2003,repeat offenders were135,295,accounting for35.6%of all cleared.Both their number and proportion have risen since1997. 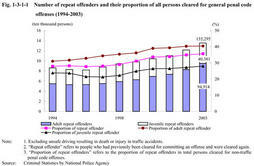 Adult repeat offenders have increased since1996to94,914in2003,and their proportion has also increased since1995to40.4%in2003(see the next section for juveniles). Fig. 1-3-1-2 shows the number of previously convicted persons(excluding those convicted for Road Traffic Law violations,but including those whose sentence lost its effect due to the expiration of the period of suspension of execution of sentence;hereinafter the same in this chapter)cleared for non-traffic penal code offenses and their proportion to all persons cleared,over the last10years.In2003,previously convicted persons were66,971,accounting for28.5%of the total cleared.Those with one previous conviction had the largest share,accounting for about one-third of all previously convicted persons cleared.Since1996,previously convicted persons have been on the rise,for those with one previous conviction,in particular. 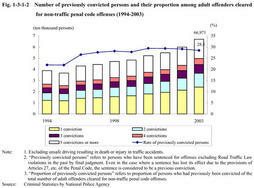 Table 1-3-1-3 shows the numbers of persons previously convicted and of those with previous convictions for offenses of the same kinds and their proportion among offenders cleared for non-traffic penal code offenses in2003,by type of major offense.The proportion of previously convicted persons was28.5%for all non-traffic penal code offenses whereas it exceeded50%for intimidation and extortion,and40%for homicide,robbery,fraud,and destruction of objects.The proportion of those with previous convictions for the same kind offenses was13.7%for all non-traffic penal code offenses,whereas it exceeded20%for injury and extortion,and nearly20%for theft and fraud.Of those cleared for Stimulant Drug Control Law violations,55.1%had previously been cleared for the same offense. 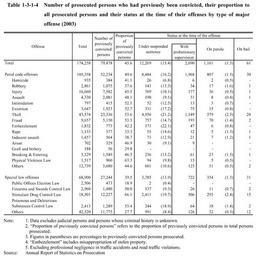 Table 1-3-1-4 shows number of prosecuted persons(excluding juridical persons)with previous convictions for offenses excluding professional negligence in traffic accidents and road traffic violations,their proportion in all persons prosecuted and their status at the time of their offense(under suspended sentences,on parole,or on bail),by type of major offense in2003.The proportion of previously convicted persons was45.6%for all offenses,whereas it exceeded60%for Physical Violence Law violations and Stimulant Drug Control Law violations.The proportion of those under suspended sentences at the time of their offense in previously convicted persons was15.4%for all offenses,whereas it reached nearly20%for theft,embezzlement(including misappropriation of stolen property),and Stimulant Drug Control Law violations.